Passed peacefully at Chancellor Park, surrounded by her loving family, while listening to her favorite church hymns. Audrey was born in Gaultois on Sept 2, 1925. She was a storyteller and the family historian. 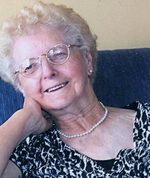 From the young age of 12 until well into her 70s, she was the organist to the Anglican churches in both Gaultois and Bay D’Espoir. Audrey loved to play church hymns and cards with her friends, and she was well known for her baking and gardening. She is predeceased by her husband, Fred; parents, John and Ann Garland; brothers, Hedley, Harold and Gordon; and sisters, Mary Green and Annie Windsor. She was a loving and devoted mother and grandmother. Audrey leaves with fond and loving memories her daughters, Judy Brushett, Jean (Paul) O’Keefe and Jocelyn Day (Ivi Hermanto); grandchildren, Duane, Stuart, Trevor, Travis, Michael, Matthew, Mark, Robert and Katherine; 6 great-grandchildren and 1 great-great-grandchild; 3 sisters-in law, Blanche Garland, Ada Day and Jean Day-Noel and a large circle of nieces, nephews, cousins and friends. Special thank you to the Chancellor Park staff on 2nd floor East Wing. Interment at the Anglican Cemetery, Milltown on Saturday May 19th, 2018 at 2pm . Flowers are gratefully accepted or donations in Audrey’s memory may be made to the Heart and Stroke Association.